Apple's new iPod touch— which packs the same A8 chip found in the iPhone 6 and 6 Plus— is an exceptionally compelling product, and one that could force prospective iPad mini buyers to think twice about their decision. 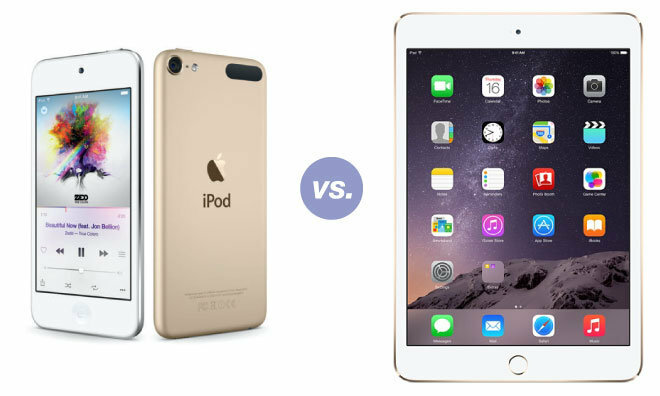 AppleInsider compares and contrasts Apple's best iPod and smallest iPad. On the surface, any comparison between the iPod touch and iPad mini doesn't look particularly apt. The two devices seem to serve much different markets thanks to their wildly disparate display sizes, but it's not so clear cut once you dig deeper. The latest iPad mini doesn't share many of the iPad Air's fancy tablet tricks. It can't run iOS 9's split-screen multitasking; it has a last-generation A7 processor and M7 motion coprocessor; its camera comes in at just 5 megapixels and lacks burst mode or slow-mo video; and it's even slightly thicker than its big brother. In contrast, Apple's new iPod touch comes with a state-of-the-art A8 processor with M8 motion coprocessor. Its iSight camera has been bumped up to 8 megapixels and gained both burst mode and slow-mo video recording, and it's tied with the iPad Air 2 as the thinnest iOS device Apple makes. The iPod touch would seem to take the feeds-and-speeds crown— save for the fact that the iPad mini also has cellular data capabilities —but functionality is what really matters. Both devices sport 326 points-per-inch IPS Retina displays, and despite the size divergence they aren't the differentiating factor you might expect. Apart from gaining access to iPad-optimized apps— most of which are also iPod touch-compatible— you don't get much more than extra real estate with the iPad mini. One thing the iPod touch can't match is the iPad mini's access to Apple Pay. Because the iPad mini has a Touch ID sensor, you can use Apple's payment system to pay for goods and services in apps like Target and Uber. Unfortunately, neither device allows you to use Apple Pay in retail stores, even if you also own an Apple Watch. You'll need an iPhone 5 or newer for that. If price is of the utmost importance, consider the iPod touch, which starts at just $199 for a 16-gigabyte unit and rises to $399 for a 128-gigabyte version. The newest iPad mini starts at $399 for a W-Fi-only 16-gigabyte variant and the top-end 128-gigabyte model with cellular connectivity comes in at a whopping $729. At the end of the day, though, the decision really comes down to how you plan to use your new device. If you primarily want to shop on the web or read books— or you need mobile data —the iPad mini is your best bet. On the other hand, if you want something pocketable that takes decent photos and doesn't come with a monthly bill from your wireless carrier, you should seriously consider the iPod touch.